Does the scientific process belong in pastoral counseling? Professional Chaplaincy and Clinical Pastoral Education Should Become More Scientific: Yes and No examines the widespread ambivalence among pastoral caregivers and educators over the growing inclusion of science in pastoral care and counseling methodologies. Twenty-three seasoned professionals in the field give candid and sometimes emotional accounts of their interest in—and reservations about—the role scientific research plays in their profession. Some authors look at the issue from a historical perspective; others voice additional concerns. A few make concrete proposals on how chaplaincy can become more scientific. The result is a unique insight into the relationship between the secular and the religious. Can what you do be measured? Do you have an obligation to embrace the challenge of change? Is becoming more scientific a necessity for staying in touch with your health care peers? How cost effective is the pastoral care you provide if it doesn’t include the scientific process? Could a reluctance to incorporate science into your counseling cost you your job? 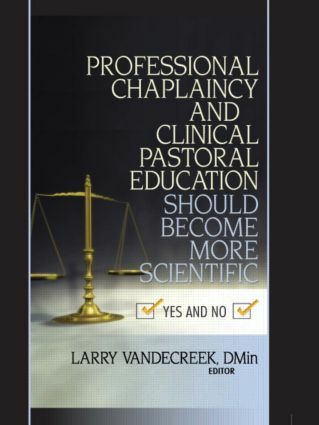 Professional Chaplaincy and Clinical Pastoral Education Should Become More Scientific: Yes and No presents thoughtful and thought-provoking debate that is a must-read for all pastoral caregivers and educators. To Be, Or Not To Be More Scientific? That Is the Question: Yes, Absolutely, But . . .
Chaplaincy Is Becoming More “Scientific.” What’s the Problem? Siblings or Foes: What Now in Spiritual Care Research?